Tray for 4 bikes and or gear. Front tray provides standing space when it is slid back. Overall lenth when bottom tray is slid forward 60″. Heigth below platform bed 37″. Compartments enclose wheel wells. Rubberized flooring is laminated to them. Available separately. Jump seats hinge down for a dinette. See picture below. L track for bike tie downs. This van includes an extra large 30G water tank and 2,800 inverter / charger. Heavy duty tray easily slides on steel roller tracks. This platform bed, is in 3 sections for easy handling. It is supported by the extended counter tops. Note the L and R van flares extend the length of the bed 6″. Available Sprinter only. Dinette is small but, helps make use of all the space in the van only 19′ long. A small table is included. To make the dinette the bikes must be outside. Slide the first bed section over the second section. Hinge down the jump seats. Then slide the top tray back for more leg space. Trays easily slide out, on roller tracks. Each tray is 25″ x 70″, total two tray dimensions – 50″ W and 70″ L. All aluminum construction, capacity 300 lb. each. Compartment floor and walls are laminated with highly durable water resistant rubberized covering. Colors are available. The enclosed platform bed keeps dust, rain, and annoying bugs out. The panels are removable. Door panels can be full height with net or water resistant pockets. Two tracks on each side for tie downs – any location. Fresh water tank, 30G, and 2800W inverter auxilary batter charger are built into the passenger side wall that encloses the wheel well. There’s some storage. UPGRADES | Aluminum trim edging door and cabinet edges. 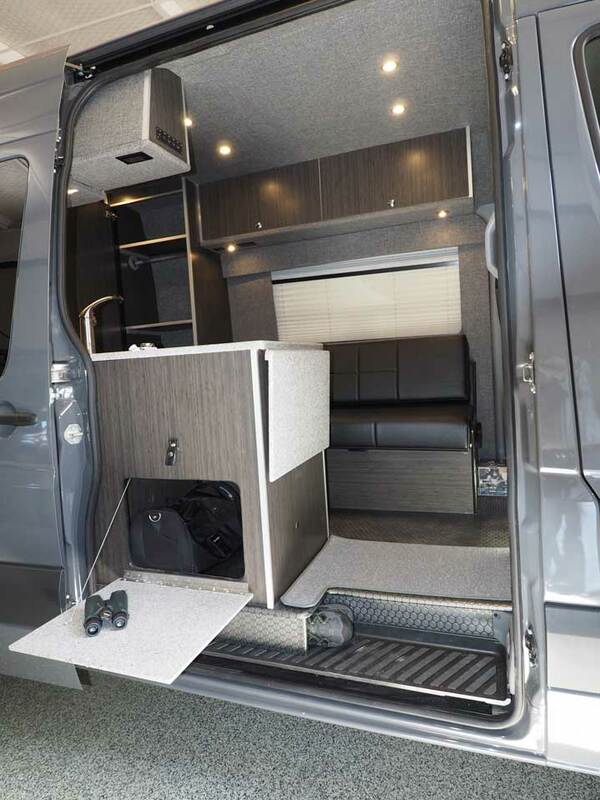 These HD bunks have lightweight 1 1/2″ square aluminium frames. For a large storage area remove the 4 bunks. Or, if you have bikes and gear to transport remove the 2 lower bunks. There’s 2 L tracks on the floor, walls, and ceiling for bike/gear tie downs. Bunk hook into L tracks. Available 1 to 4 bunks. The Captain Seats are removable, swivel, and recline. Very comfortable Captain Seats. A storage cabinet with drawers is on the passenger’s side. It could also be made to be removable. The galley has a 4CF stainless fridge and 10G water supply. A microwave is above. The cab seats can swivel to face the rear seats for socializing. A portable table is standard. Wong’s Sportsmobile has a unique platform bed arrangement. When he is travelling alone he has a single bed and can leave the 3 section platform bed at home. This leaves the rear compartment full ceiling height. If two are travelling he can have a full size platform bed for 2. Two more can sleep on the gaucho bed. The rear is quite large for bikes and gear. Floor and walls are covered with tough easy to clean rubberized flooring. The left compartment encloses the wheel well. The single bed cushion provides a top. The platform has full width bed support rails for two different bed heights. Bed cushions can stow in the left compartment. A Porta Potti is lcoated in the front. Slides out for use. The single bed cushion is 30″ x 78″. The upper bed cushions can serve as shelf space in this arrangement. Three 26″ x 66″ cushions make a bed about 78″ x 66″. Use the upper bed supports when the bikes are in the van.